My mind was wandering, thinking of a new design concept when an older project came back in my memory. I have been in my version of Downton Abbey for about six months, I recall saying. The house was in construction when I was hired as the interior designer who would have added the beautiful touches to the architect work. Only the frame of the house was up and completed, no flooring, no sheetrock, and plumbing/electrical work were still exposed. The roof covered the bare walls. Looking around the bare house to get familiar with various rooms, I soon noticed this was a 6,000 square feet home, one could get lost in this house. It was beautifully laid–out, natural light pouring in every room and a lot of modern amenities were put in place like an intercom. The couple was in the middle age, well to do and conservative in taste, but all the features that provided comfort, convenience and pleasure were very modern. Next to the living room, a billiard room had been planned. Across from the living room, there was a curvy staircase, which later when I dressed it up, became an attractive feature. It led up to the second floor, where an elegant studio and a library set on an open loggia overlooked downstairs into the great room. The upstairs floor plan struck me and the request was to make it into a living quarter, more than a sleeping quarter. In the master bedroom, I had to plan an area for red wines and a refrigerator for champagne or white wines, a large fireplace and a food lift communicating with the kitchen downstairs to bring up the food in the bedroom at any time wanted, which the cook made in the kitchen. Two master baths for him and her, both with a steam shower, two walk-in closets for him and her, a large gym with T.V. and stock exchange electronic device. Music speakers everywhere filled the master bedroom spaces with their favorite music and an enormous amount of lighting illuminated the areas as if it was a perennial daylight. Later, I learned about the habits of the inhabitants of this house and realized the couple lived mostly on the second floor. The upstairs corridor hosted five bedrooms each with its own bath and an elevator for the convenience of the people using the upstairs spaces. Hmm, with that beautiful staircase I designed, I would have used the stairs every day to enjoy the beauty of the material and to use it as a daily exercise. Downstairs, among all the rooms beautifully laid out, there was a non-defined space between the kitchen and the formal dining room. That was the Butler’s Pantry. I mean a real Butler had been hired to take care of the affairs of the house. The rest of the rooms, laundry with a full bath, wrapping packages room, large kitchen, family room, breakfast nook, guest room with a bath, billiard room, living room, great room, and a large foyer completed the downstairs. To put in place all the nice details in that house it took about six months and when we completed the construction phase, the décor started to emerge. The butler’s pantry started to take an incredible shape. The space did not contain food, there was a large pantry nearby the kitchen dedicated to food. The butler’s pantry was an elegant space for an elegant service. For a soft illumination, I placed a beautiful chandelier in the center of the ceiling and various sconces attached at the wood pilasters of the cabinetry. The only appliances needed in that space was a commercial type espresso maker, a microwave and a beautiful hammered copper sink with a natural stone counter. 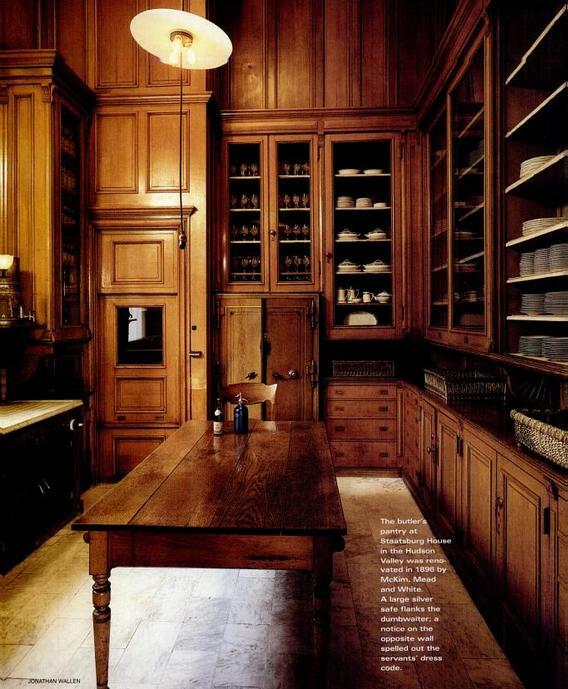 The Mahogany cabinets were furniture, not kitchen cabinets. Glass doors illuminated from the inside showed in plain view all the riches of the house, a lot of illuminated rollout shelves for conveniently taking items from the back of the shelves, stunning architectural details and an elegant butler’s desk completed the décor. The butler’s pantry separated the kitchen from the formal dining room for a reason. It’s not elegant to let the guests in the dining room hearing kitchen noises and smelling cooking odors. I wanted a rarity item in this special room that only a man in livery and white gloves was going to use: a butler’s ball, which I found at an antique store. 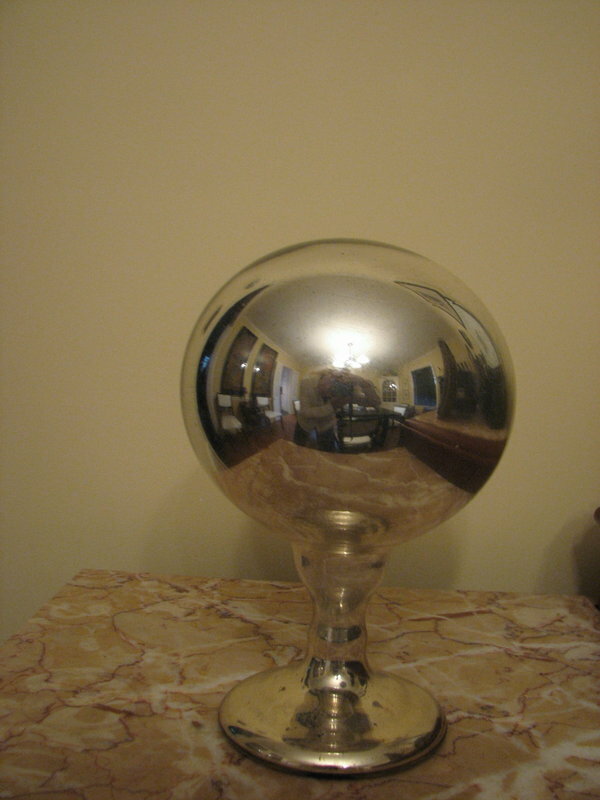 It alerts the servants or the butler that the guests sitting at the dinner table need assistance without staring at them or standing behind their back. Opening up boxes and filling up the cabinets with items serving the dining area, I delighted myself looking at with some refined tablecloths, fine wine glasses, some were even reproductions of Renaissance era, silver trays, ornate buckets and candle holders, interesting modern and antique dishes, and a plethora of table accessories, such as asparagus tongs, egg topper and a serious collection of teapots. I had never seen such items in an American home and I was very pleased. Modern Americans are mobile, they move often and when they move also sell part of their possessions. I really thought these objects were not just dust collectors and a way to keep the butler busy polishing. If they have them is because they use them. The lifestyle of the inhabitants of the house was not like everybody else’s life, I know that, and this butler’s pantry was not an ordinary functional room off the kitchen where to store food, as most people would do. There was a house full of people working there, thus the butler was the manager of all and the Maître d’hôtel of entertainments. I never thought in these modern days I would have seen anything like this, but I did and I was part of the “downstairs and upstairs” lifestyle. I was part of the “Downton Abbey” type of play for about six months and I am dreaming every day to have a Mr.Carson around. Oh, this sounds gorgeous! Great work, and such a lovely post as well. Thank you for stopping by and taking the time to comment. Looking forward to your posts as well.